Two things I am a huge fan of – versatile pieces and statement pieces. My typical look is created with basics, then layered with one or two statement pieces (usually a jacket, shoes, or a bag) to complete the outfit. And if a piece can be worn or styled in at least two different ways, I consider that a major win for my closet. This beautifully, tailored, sleeveless, Marceline trench from Zelle Studio commands attention with its clean silhouette and minimal style. I came across Zelle Studio and instantly fell in love with the UK brand. They believe in creating timeless, essential pieces for a modern wardrobe. What is unique about Zelle Studio is that they produce a core collection and also add seasonal pieces that are never repeated once they are sold out. I love this concept because not only does it foster less waste, it also fosters an exclusivity appeal to their customers (kind of like Chanel and their seasonal bags – like if you don’t get it now, you will miss out). Because Zelle Studio produces mini collections throughout the year, their attention to detail, quality, and meticulous designs are evident in all of the pieces they sell. This classic, trench gilet is chic, yet makes for a major statement. I love that it can be worn multiple ways as a vest dress or as a jacket layered over a sweater or tee. The material is thick and of high quality and the inside lining is navy, a nice, subtle contrast to the black vest. It features a sharp collar which I like to pop up for a more chic look, two pockets which are always a bonus for me, and the side trench vent makes for a subtle, but tailored detail. This vest is one size fits all at a UK 8-12, but surprisingly it fits me quite well and I am usually a UK size 2-4. I like that the trench has room in it so that it can be thrown over layers for the colder months. The Marceline Trench is a perfect must-have piece for fall and winter and definitely one you will continue to reach for in your closet. This trench is one of their seasonal pieces, meaning it won’t be remade once it is sold out, so get it while you can! If you’re like me and enjoy classic and chic pieces that also timeless, you have to check out this trench gilet and the many other amazing collections that Zelle Studio has to offer. Thank you Zelle Studio for sponsoring this post. All reviews, styling, and thoughts are my own. I love lengthy pieces!!! They’re so versatile and can be dressed up and down. 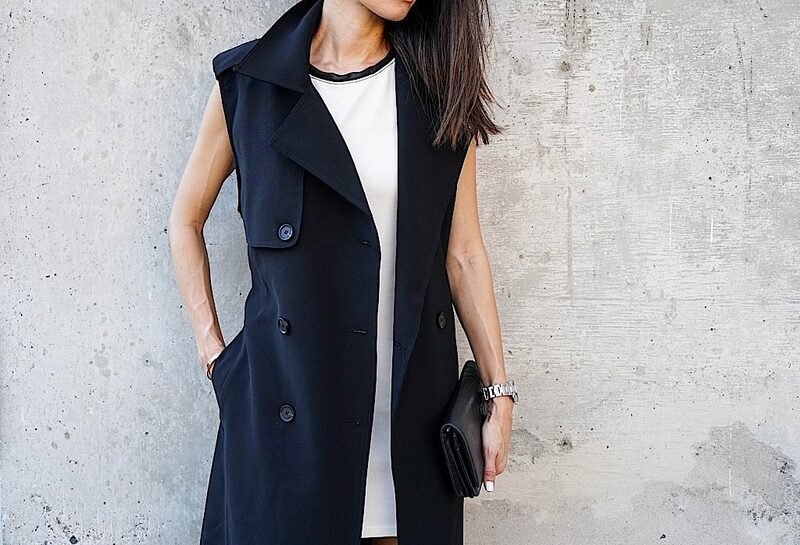 This sleeveless trench is stunning! 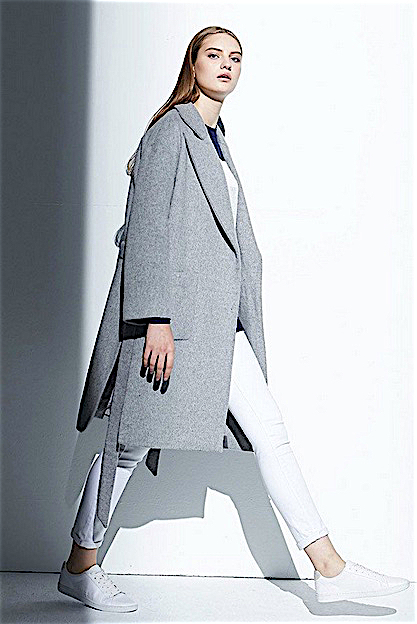 Love how you contrasted it with white and those fab booties! It’s so cool that Zelle Studio has a specific collection that doesn’t repeat! I definitely agree that it reduces waste and it makes all the pieces a little more special since they won’t be available again. Will definitely check it out!! Thank you Jenn! I am all about a statement piece that can be styled in many ways. I can totally see you in this trench with your OTK boots too! They definitely have classy and timeless pieces with a modern edge. Totally, right? I’ve been wearing this vest non-stop! Love how you styled this vest! You look so chic and edgy. and those booties are TDF! Thanks Raysa! I love this vest and like how it can be styled to look edgy and also to look chic and classy. Thank you Erin! I definitely will be wearing this vest all fall and winter! Sleeveless coats and trenches are my jam these days! This one is no exception in its beauty and timelessness. I absolutely love it and Zelle Studio’s collection is truly stunning. I want everything! You look stunning as usual Christine! Thank you Jen! I love how a trench can change an entire look! It is that one perfect and timeless accessory that you must have. As you can see, all of Zelle Studio pieces are made with such great detail and minimal design that you can’t go wrong with any piece! You look so stunning! I really love your trench coat! Thank you Shaine, I appreciate it. This trench is one of a kind! I really adore you and obsessed to your fashion sense. And you know what, everything you wear will suits you perfectly. For me, you are supermodel! Lovin’ every bit.. Stay blooming! Aww you are seriously the sweetest and just made my day! Thank you so much Katrina! Babe, you look extremely chic! I’m so in love with your look! Thank you Lucrezia, I appreciate it. This vest definitely elevates the look and adds to the chicness! I love me a good trench! The sleeveless ones you have suits you so well, I actually never seen a sleeveless one before ! Definitely the perfect time to bring them out before puffy jacket season sigh! Thank you Lisa! I love the sleeveless aspect because you can wear it year round in the warmer months and layer it in the colder months! This sleeveless trench looks so luxurious and so perfectly tailored! Zelle Studio sounds amazing, I am obsessing over that sleeveless camel trench you picked too! Hi Emily! Yes, their quality and tailoring is amazing as you can see from the favorites I picked! Christine, i’m always looking for statement pieces that male a look and that trench is quite perfect for that. I definitely love how it fits you perfectly, and make the all outfit more elegant with a twist. I had never heard about Zelle|Studio before so i’m glad you wrote this post. Thanks Catarin! I am all about a jacket adding to the outfit and this trench can be worn year round and is so chic! Zelle Studio makes such timeless and minimal pieces you definitely have to check them out! Thanks Darlene you are so sweet and also provide me with inspo yourself! The feeling is mutual! Thanks for introducing such a chic brand! I love the idea that once it’s sold out, it’s never get back in stock again! (Then I have the piece most of the other people don’t have lol) Nice outfit! Totally Margaret! I like having unique pieces as well and they are not only unique, but also very timeless. I love the idea of them having seasonal collections which are unique and if you don’t get them now, well, too bad, cause it wont come back… And that vest is certainly stunning on you sweetie! always beautiful Christine! youre an inspiration!! I love how you style basics in an elevated way so that the outfit looks so classy! Always looking so put together dear. 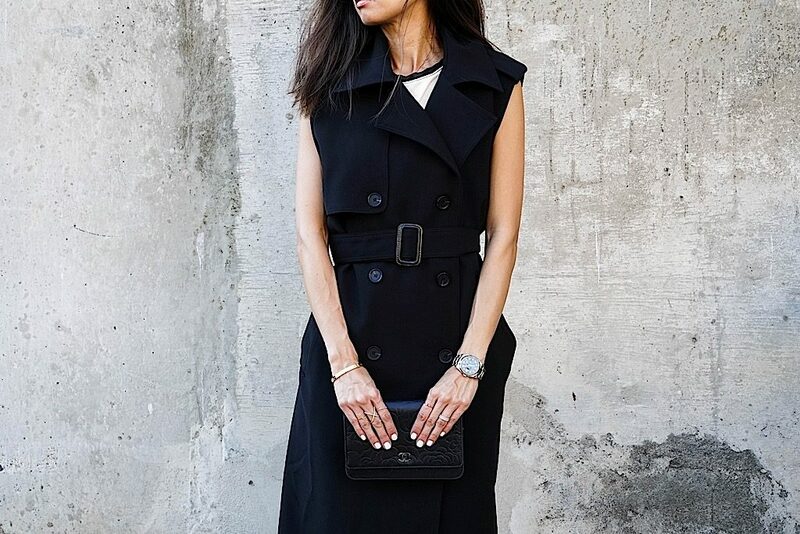 Obsessed with your trench – I need a sleeveless one sooooo bad! Just gorgeous! So haawwwttt! Love the contrast of lengths between the mini dress and trench vest!! love how you styled this look! I need a trench like this!! Thanks Samira! This is definitely a trench to have in everyone’s wardrobe! Couldn’t agree more! My wardrobe is full of either pieces I can wear a thousand times with different outfits, or things that make a statement! Loving this longline vest on you babe! Thanks Ashleigh! I think those pieces that you wear a thousand times and can still be worn over many years are totally worth the investment. Love love this look on you babe!! Thank you so much Nina, you are too sweet! Love this trench on you! You styled it so perfectly with those booties! Thank you Lauren! This trench is perfect for all year round and added these booties for the fall weather. Thank you Jessi. The coat speaks for itself so figured I would keep the other clothes minimal to show off the trench more! I love this coat! It’s so chic and versatile! Thanks Maryam, it really is a statement piece that I can keep forever! Thank you Lindsey! I agree, this trench is definitely a classic piece that I will wear forever. Such a chic white and black look ! I love your black sleeveless trench. Thank you Margot. Black and white are always my go to and I love that they are classic like this trench! 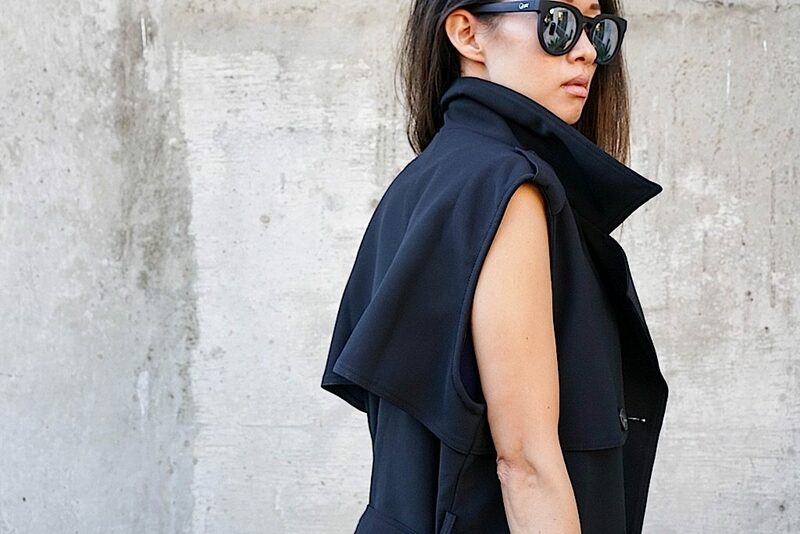 This sleeveless coat really is amazing! And totally in love how you styled it with the shorter dress!